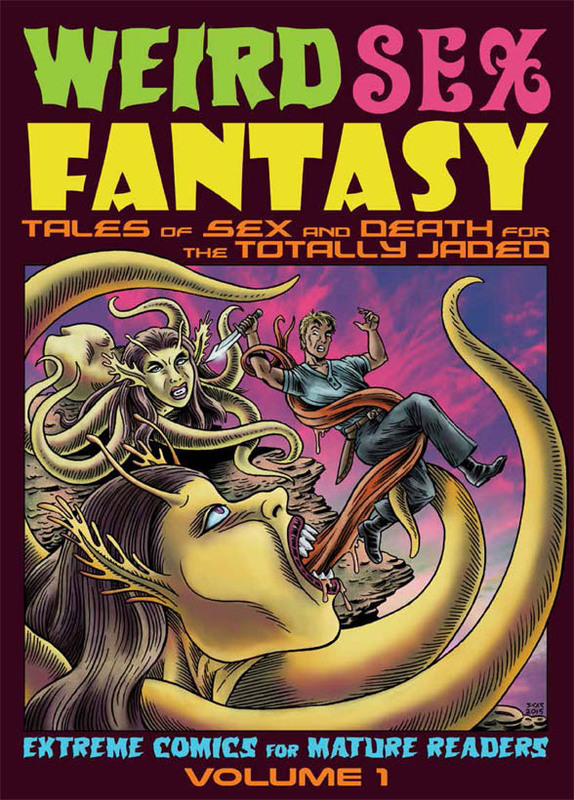 A Graphic Novel by SCAR and Foreward by Canada's aficionado of sleaze, Robin Bougie (Cinema Sewer)! in Sleazy Slice by Robin Bougie (Canada). 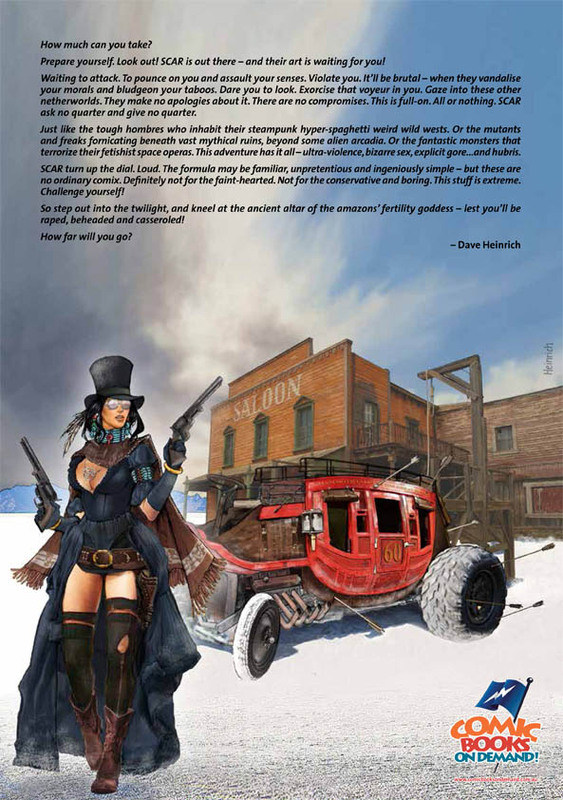 WILD BESSI - DEEP STRIFE IN MASTODON VALLEY - With the vengeful gunslinger Six Gun Cindy hot on his trail, the notorious philanderer Reginald Dawson flees into Mastodon Valley, the domain of Wild Bessi and her murderous band of outlaw Cowgirls. AUSTRALIA AFTER THE FALL - In a post-apocalyptic world infested with bizarre, licentious mutants, two rangers venture into the wilderness searching for a pair of missing girls and encounter a nefarious religious cult. Sample pages. MENACE OF THE MOON MATRONS - A disturbing retro sci-fi foray into the bowels of the moon where monsters dwell and lascivious moon-nymphs have evil plans for a group of stranded astronauts. PLANETOID OF THE PINHEAD PYGMIES - Stacy is eager to become a member of the exclusive Sporty Space Sisters, an all female hunting club that has just acquired its own private planetoid -- a world overrun with menacing and libidinous mutants. It is on this strange moon that Stacy must face her initiation into this unique league of women. Z'BULA - WAR QUEEN - S’bett, daughter of Z’bula (War Queen of the Gahal) has been abducted and sacrificed to dreadful winged fiends that crave women. Time is running out for the War Queen as she desperately tries to save her only heir to the throne while battling her way through a web of deceit, intrigue and horrific marauding beasts. Meanwhile, her savage enemies are gathering their forces for a major attack. MYTH-ILLOGICAL MISFITS - A group of Amazons are stranded upon the “Isle of Lost Beasts” and become the prey of numerous mythical monsters, which relentlessly lust after them. Their only choice is to somehow turn the tables on their tormentors and wreak savage retribution. LUST OF THE BLOOD SWAMPIES and SCARRED FOR LIFE - While exploring an alien world a hapless Earthman is violently assaulted by a group of predatory, semi-aquatic humanoid females and goes on a rampage, hell-bent on bloody vengeance.